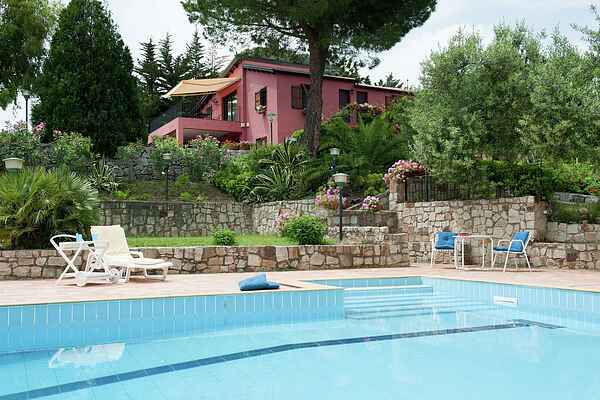 This beautiful and well-kept holiday villa offers a beautiful view of the mountains and the sea. The villa is entirely renovated and split into 2 holiday homes. You will share the large swimming pool, with diving board, with the residents of the other home. Apart from the swimming pool you also share the large garden with several playsets, and a washing machine with the other residents. Just 6 kilometres from the home you will find a beautiful sandy beach with azure sea. You can shop for daily groceries only 3 kilometres away. The home lies in the small town of Collesano. This village hosts a beautiful park where you can take a nice stroll. The house is about 20 kilometres from Cefalù. Next to the historic centre, this town is also known for its beautiful coastline. In the middle of the city centre you will find a charming square with nice terraces. The cathedral lies on the highest part of the terrain right next to the large lime rock which is built in Arab-Norman style. On the other side of this rock is this village's nice port, that used to be a fisherman's village. In the hills of Sicily is your ideal free-standing, well-kept villa with stunning views over the sea and the mountains. You are in the middle of Sicily, 20 km from Cefalu and 60 km east of Palermo. Cefalu is one of the most famous resorts of the island with a sandy beach, numerous beach bars and a city by the sea with beautiful buildings and narrow streets to explore. Palermo, the capital, is worth a visit. Visit the parks and imposing, historic buildings that this city is rich and wallow in the working class neighborhood where you see clotheslines everywhere . As Italian as ever! However there is also an Arab town. Not strange when you consider that many nations have dominated Sicily in history. Next to the Arabs and the Greeks there where Romans, Byzantines, Normans, French and Spanish rulers. The coastline around Cefalu is very worthwhile and within reach. 6 km from the nearest sandy beach and a beautiful blue sea. Supermarket, bakery and restaurant 3 km.